Cotton Cordell Spoons - 2pk. 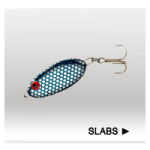 Delivers a fluttering, eye-catching descent that resembles a dying shad and varies in speed depending on the lure's weight. Features sturdy hardware and strong, rust-proof hooks ideal for fresh and saltwater use. Assorted sizes available. ..